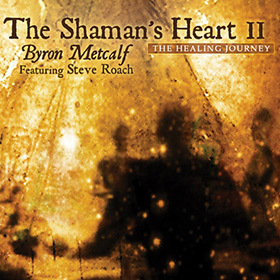 The Shaman’s Heart II is an entrancing 70-minute shamanic journey of uninterrupted, evolving tribal-trance drumming and percussion that continuously builds in rhythmic complexity and dynamic intensity. Byron is joined by Steve Roach who provides the harmonic and textural psychotropic stew created from a rich, organic and analog blend. The alchemy with the percussion results in an ecstasy that helps hold the space for the listener to journey far and deep into powerful and sustained shamanic states of consciousness. The journey culminates in a bursting forth through the full spectrum portal of pure existence – returning safely home to the heart-centered presence and potential of the true self. Copyright © 2017-2019 Grof Transpersonal Training. All rights reserved.